For 1" diameter wrought iron curtain rod pole. Antique drapery rods, wrought iron collection. Note: Price for base color black, other colors are more and will reflect addition in cart. 1 3/8 inch Kirsch designer metal Rao finial end cap for designer metal curtain rod poles and traverse rods. 1 3/8 inch Kirsch designer metal telescoping traverse rod poles comes in six new colors. Sizes to fit windows from 38 inches to 270 inches wide. Each set includes plugs for finial and brackets for mounting. Ring slides included and twenty style finial options to complete your decor. White finish. Bulk Pack, rod only Bulk pack 10 each minimum order. See below for smaller packs. Superfine traverse rods. Rod only. Two way draw, stacks to both sides when drapery is open. Brackets, supports and cord pulley must be ordered separately. Made from heavy guage steel with a baked enamel finish. Exclusive Kirlon on all sliding surfaces. Push in brackets and extension plates are available as an option. Only the finest pulley sets are used. Strong and durable with a slide gate for easy removal of extra slides. Long wearing, stretch resistant polyester cord and continuous lacing for use at either end or to convert to a one way draw. Two way draw, extends from 86 to 150 inches. Note: Packed for easy storage and use in hotels, commercial buildings and hospitals. Made of vinyl coated fiberglass yarns. Comes in 72 inch wide fabric. Available in cut yardage or 30 yard bolts. 1 3/8" Bypass bracket that coordinates with designer metal curtain rod poles. This bracket mounts in between the two end brackets and allows the C-rings to pass when opening and closing your draperies. 1 1/2 inch diameter indoor or outdoor curtain rod in 4 foot, 6 foot, 8 foot and 12 foot lengths. Available in two colors in stock, ready to ship. It can be used indoor or outdoor. Use on those windows that face patio or pool area, or use inside on any window. Charleston collection by Design Elements. Note: 12 foot rods have to ship by truck. Call for truck shipping cost. Black finish Decorative Traverse Rods.Adjusts from 48 inches to 84 inches in width. Projects 3 1/2 to 4 1/2 inches, clearance 2 1/2 to 3 1/2 inches. 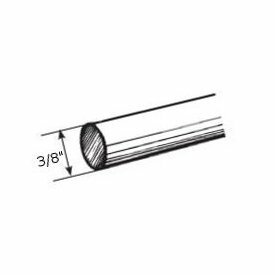 1 1/2 inch diameter Windsor curtain rod. drapery hardware collection by Graber. Rods are metal, slides and finials are plastic, includes mounting hardware. The 94004 series Kirsch Architrac system is used for baton or cord draw cubicle, pinch pleat and Ripplefold draperies. This system measures 1 3/16" wide by 13/16" high and is made of .050 extruded aluminum with an white finish. This track cannot be bent or curved. Wide assortment of parts to accommodate your drapery design.